During depression the world disappears. Depression is a serious mental disorder that shouldn’t be taken lightly. It affects approximately 300 million people worldwide. It is estimated that one million people globally commit suicide. These statistics are unfortunate and shouldn’t be happening. One life lost is too much. The sad truth is that suicide catches everyone’s attention. It’s the actions leading to it that go unnoticed. Therefore, we should give a hand to those battling with mental illness, and not minimize their experiences. Just because you don’t understand doesn’t mean their struggles are any less important. I’ve personally struggled with depression since I was 11 years old. It being worse in my teen years and young adulthood. Unfortunately, my mother did not take me to see a psychologist when I was a teen due to fear and believing the stigma attached to it. This doesn’t mean she didn’t care, it was simply that she didn’t know any better. That’s why it is extremely important to teach about mental illness. I took my mother approximately 15 years to realize what was going on with me. I interviewed my mother because I believe its important to understand the other person’s point of view. By doing so we can fight against the stigma. When did you start suspecting that your daughter suffered from depression? When she broke up with her last boyfriend. She began to show a change in her behavior, crying all the time. I suspected she was co-dependent of him, it made me feel very angry and disappointed. I did not agree with the relationship since the beginning. I let her know about it, but, unfortunately, she had to find out by herself. Yes, very hard. I didn’t understand her erratic behavior and irritability. She isolated herself in her room and didn’t talk to anyone. She was very careless with her personal hygiene. What’s one thing you wish you knew about depression, that would have helped you understand her? Depression symptoms and how to treat it on time. I understand we avoided her suicidal episode on time. Thank God, my daughter is a bright lady and she asked for help before continuing with the idea of suicide. It makes me feel worried and concerned about her. I cried when I was alone and talked to my husband about the situation. I was so afraid of losing her. She is my very first baby girl and I cannot handle losing her. I want her to have a great future and be a successful. She is a brilliant woman. What are the telltale signs you notice when Michelle is starting to fall into a depressive episode? She becomes irritable and doesn’t care about our feelings for her. She stops talking and when she arrives home she doesn’t say anything to us. She immediately walks to her room. It is like we do not exist. You can also notice it in her face. She is in her own world alone. Does her personality change when depressed? Yes, she refuses to talk. She is also upset with everything and everybody. She can be hours alone in her room doing nothing. How does the lack of sleep change Michelle? She is very irritable and the next day she wants to be the sleeping all day. It’s like she is not at home. Do her eating habits change? Yes, the only thing she wants to eat is chocolate, candies, and ice cream. I also suspect she eats very little food, which makes me feel concerned, because her father’s family suffers from diabetes. How did you help your daughter after finding out she was suicidal? By supporting her visits to the psychologist and psychiatrist. I try to be her companion as far as she allows me to be. I try making her laugh and help her understand that I love her. How do you think it affects your daughter’s life the most? Depression makes her feel and think she can’t do anything, like she’s worth nothing. Depression doesn’t let her realize the wonderful human being she is, and all the opportunities she has in life. To me she is an extraordinary young woman, very intelligent, beautiful and amazing. What things Michelle does, that worsen her depression? It can be summarized in these words, “Michelle stops believing in herself”. What things does she do to help herself feel better? She walks, does physical exercise, goes to her doctors’ appointments, and tries out new diets that benefit her health. Besides depression, Michelle has rheumatoid arthritis and I understand this condition is making her feel worse because she is in constant pain. Do you think her depression, will affect her future? If she doesn’t take control over it, yes it is going to affect her future. But I am very positive. I know she is getting stronger and overcoming this situation. With the help from her doctors, our support and love at home, she will go ahead and have a normal life. When your daughter told you she needed therapy, what was your first thought? I couldn’t believe it and said no, not my daughter! I began to think she just wanted more attention. At the time, I was alone with her and my son. I was studying and working at the same time. I felt guilty not having much time for them. Since Michelle started to go to therapy, have you seen a difference in her? If so what? Yes, he behavior has changed. She has improved a lot with the therapy and slowly Michelle is finding out, that she can go far with her life and studies. She is in the process of discovering the amazing human being she is and all the wonderful things she can do. Depression is a crippling mental illness, but do you believe this ordeal has made your daughter more compassionate and understanding? Of course, she understands very well people suffering from depression. She even wrote a book of mental illness. She has the ability to diagnose and identify it fast. What has depression taken away from her that you wish she could get back? Her sweet smile, her confidence, the happy girl she used to be. But I know she is getting strong and she will be the same beautiful and happy daughter I used to have. If you could give your daughter and anyone else who struggles with depression advice, what would it be? To pay attention to the mental signals, our body talks and sometimes we don’t pay attention to it until is too late and people commit suicide. To ask for help and go to the doctor in order to treat their mental health. Life is very fragile and it’s our responsibility to take care of it. We are worth a lot and we deserve to be happy. From observing your daughter’s experience, what’s one stigma you wish the world would let go off? The world must understand that people who suffer mental illness need help. That they have the same rights as a person without mental illness. People with mental disorders have the right to be healthy and live a normal life. We must break the stigma that people are crazy, and that they must be secluded in a mental institution. It’s not okay to be seen different! Has your daughter’s struggle with mental illness, changed the way you see it? Of course, watching Michelle struggle makes me see and think different about people, about their needs and how important is to treat the condition on time to avoid losing precious life. Although, It took my mother years to understand. I have been lucky to have her support and unconditional love. The reason I interviewed her is because I believe it is important to understand what others think. Only then we can all work towards a solution. Understanding each other the good and the bad will create a world more compassionate towards suffering. 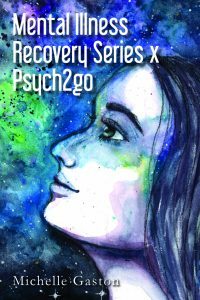 Did you know Psych2Go has a book about Mental Health Recovery?